Looking for a truly unique gift for the upcoming holidays? Check out the Limited-Edition line of camo-colored reels from Accurate Fishing Products. Each year Accurate offers a run of limited-edition reels for the holidays. 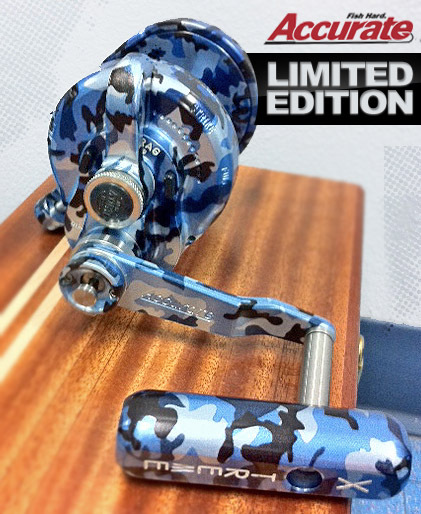 This year, they really smacked it out of the park with this killer reel coloring that features a water-camo pattern. The pattern is made up blue, black and white, much like some of the popular dive gear and board shorts currently on the market. The coloration of the Limited-Edition Accurate’s isn’t just on the body of the reel, either. It’s on all of the parts, including the power handle, arm and two-speed mechanism. The Limited-Edition reels featured Accurate’s same anodized protection process and the white lettering on the side plates really pops against the camo. Sizes and models featuring the Limited-Edition coloring will be assorted depending on dealer orders, but all of Accurate’s most-popular reels and sizes will be available in the water-camo, including the Boss Xtreme two-speeds, some narrow-spool reels, the ATD models and even spinners. Reels are being delivered to dealers now and will be available for holiday shoppers. You can find a full list of shops that will carry the holiday reels by visiting the Accurate Fishing Adventures page on the BD Forums at www.bdoutdoors.com/forums/accurate-fishing-adventures. To purchase a reel, go directly to one of the dealer’s listed. For more information on Accurate Fishing Products, visit www.accuratefishing.com.